After the multiple steps of harvesting are complete, bales are finally ready to be secured. Hay Tarps are one of the most cost effective ways to secure Hay. 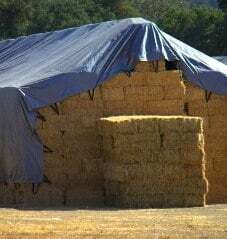 The right tarp can properly secure hay bales from inclement weather, mildew and mold in order to avoid losses. Selection of the correct Hay Tarps product is very important to protect the farmer's investment of time, effort and money. The right tarp can properly secure hay bales from inclement weather, mildew and mold in order to avoid losses. Our hay tarps are time tested, designed with farmer's specific needs in mind. Once farmers use our hay tarps they do not feel the need to invest in barns and other expensive covers. Our hay tarps are UV treated for best protection against all weather conditions. They are silver on top to reflect UV Rays and sunlight, and keep the hay from absorbing heat. Our Hay tarps are made with 8-oz polyethylene material with web looping along the length. We also make customized hay tarps to meet your specifications. Suggested uses: Hay Covers, Barge Covers, Landfill Covers, and Pit Liners.